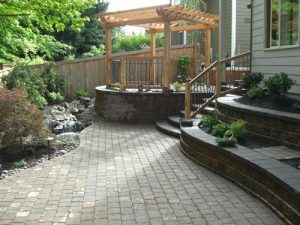 The Boulder Falls Landscape team can help homeowners discover an endless variety of patio pavers. Some of the most popular pavers are made of concrete, but others are brick, stone or flagstone. This means that homeowners have a variety of choices when it comes to shape, size, and color. The days of the plain, boring, poured concrete hardscaping are definitely in the past. In addition to providing a surprising variety of styles and colors, paver patio design also makes good economic sense. Once pavers are installed, they can easily last for the lifetime of the home. When they are professionally installed, a paver patio won’t settle or sag. What’s more, you don’t have to worry about cracks. If any portion of the pavers does get damaged, replacing or repairing that section is a cinch, and there’s never a need to replace the entire installation unless the homeowner is ready for a new look. People who have patio pavers love how strong the surface is. In fact, patio pavers are approximately three times stronger than poured concrete surfaces. This means that pavers are up to the job even if it’s necessary for them to support a large vehicle. Just as important, the surface of the pavers can be made completely flat, which makes it suitable for lawn furniture and playing children while also minimizing trip hazards. Paver patios are an incredibly versatile hardscaping material. They can be arranged in almost any pattern, shape or configuration, so by choosing pavers, homeowners are able to let their imaginations run wild. Paver patios can add tremendous value to any home’s beauty, and functionality. Choose professional installation by the expert technicians at Boulder Falls Landscape to ensure complete satisfaction. There are no right or wrong choices when it comes to choosing pavers and paving stones for a home. Some options are more suited for certain areas than others, but many homeowners enjoy the process of finding materials and designs that work for their individual home. Working with a contractor can provide valuable guidance as to which materials come with the greatest benefits and the fewest drawbacks. Call Boulder Falls at 360-991-1347 to learn more.